Ancient wisdom. Modern technology. These world-first products combine the best of nutritional science with the time-tested principles of Chinese herbalism. Each powerful formulation gives the specific nutritional support needed for our modern lifestyle. Master Formulas are made without artificial colors, yeast, or preservatives. Prostate health is a concern for all men over 40. 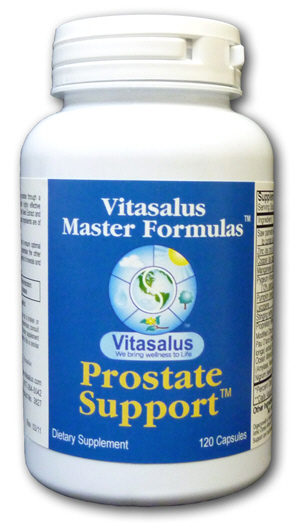 This incredible product is specially formulated to give nutritional support for the prostate gland. Enriched with Saw Palmetto Extract, Pau D-Arco Bark, and Pumpkin Seed Extract, which contains the powerful antioxidant Vitamin A. This is a multivitamin plus product in convenient 3-capsule on-the-go packets which provide a powerful daily dose of essential vitamins, minerals, & antioxidants. The foundation of the entire Master Formulas product line. Just one packet in the morning and one in the evening give the nutrition our bodies need with the convenience our modern lifestyle demands. Today people are dieting, eating on the run, consuming empty calories, and coping with all kinds of modern-day stress, which may result in great demands on the body and mind. Therefore it's important to consume the right kind of multivitamin every day to enhance the way we feel. Each pack contains three superior supplements--a Mega Nutrient, Mineral Complex, and Antioxidant Formula. The cutting-edge formula Mega Nutrient is packed with vitamins, minerals, and important nutrients to help nourish your body. The Mineral Complex is a purified blend of minerals and trace elements, Magnesium and Potassium, to help give your body balance. And the Antioxidant Formula contains Vitamin A, Beta Carotene, Grape Seed Extract, and Ginkgo Biloba for nutritional support in helping the system detoxify naturally. Formulated to help support oxygen intake and respiratory system effectiveness. A powerful combination of herbs recognized for their excellent respiratory properties--Oat Straw, Zizphus Fruit, Polygala, and Cayenne Pepper--gives nutritional support to those who have made the decision to stop smoking. Best if used with Master Paks. Nutritional support for the liver, which is vital for optimum health. An excellent formulation of nine key vitamins blended with highly recognized herbs, such as Milk Thistle (80% Silymarin), Red Beet Root, and Dandelion Root. Also includes powerful antioxidants. Best if used with Master Paks. Male Ching provides nutritional support for a healthy sexual drive in males. This unique formula contains high-quality vitamins, herbs, and antioxidants that work synergistically to help promote libido and reproductive function. Best if used with Master Paks. Relax. A uniquely blended formula designed to help you work and feel your best in today's hectic lifestyle. Contains the highly acclaimed St. Johns Wort as well as kava kava root and panthothenic acid (Vitamin B5) to help combat stress and anxiety. Best if used with Master Paks. An incredible formula providing nutritional support to your brain. Contains ginkgo biloba, bacopin®, centella asiatica extract, and phosphatidyl serine--all touted for aiding mental activity. Best if used with Master Paks. Specifically made for a woman. This unique product helps give nutritional support during and before menses (i.e. periods). Contains herbs renowned for their beneficial properties: dong quai root, red raspberry leaves, borage oil, wild yam root, and magnesium. Best if used with Master Paks. Nutritional support for your joints and tendons. A potent formula of vitamins, antioxidants, and herbs such as glucosamine sulfate, ginger root, bromelain, and queen of the meadow, recognized for their beneficial properties. Best if used with Master Paks. Helps promote healthy bones. Special formula contains vital minerals - boron, calcium, copper - with necessary amino acids to give nutritional support to the skeletal system. Best if used with Master Paks. Natural and effective nutritional support for the urinary tract. This amazing product contains alfalfa leaf, reputed to detoxify the body, as well as cranberry concentrate, bearberry, grape seed extract, and the herb, buchu. Best if used with Master Paks. life. Best if used with Master Paks. A unique formulation offering nutritional support to the adrenal glands, which help your body to cope with stress and maintain salt levels, fluid concentrations, and blood pressure. Features a Vitamin B complex to aid energy production and borage herb, touted as an adrenal tonic/gland balancer. Also added are astragalus root S. E., used in China to revitalize and restore energy; and parsley root, recognized as helpful for bladder, kidney, liver, lung, stomach, and thyroid function. Best if used with Master Paks. Synergistically blended nutritional support for the breasts. This sensational formula contains the cutting-edge ingredient calcium D saccharate - a naturally occurring compound found in humans and plants - recognized as a vital preventative for good breast health. Also includes Coenzyme Q1O, a vitamin-like substance and powerful antioxidant. Best if used with Master Paks. cell function. Best if used with Master Paks. Soothe your hectic life. This exceptional blend of herbal extracts - including kava kava, valerian, scullcap - help combat anxiety and support a restful sleep. Also includes pantothenic acid, known as an "anti-stress" vitamin. Best if used with Master Paks. Nutritional support for the body's natural defense system. This unique blend of high-quality vitamins and powerful herbs contains echinacea, maitake mushroom, elderberry extract, burdock root, and red clover tops to help cleanse the system. Best if used with Master Paks. Exceptional nutritional support for arterial health. This unique product includes cutting-edge ingredients, such as gugulipid®, inositol, and Omega 3 Fatty Acids. Best if used with Master Paks. Get turbocharged! This powerful formulas contains special herbs--Cayenne Pepper, Gotu Kola Herb, and Guarana Extract--to help enhance energy. Best if used with Master Paks. Advanced nutritional support for the eyes to improve night vision and for clear vision during the day. A world-first in its array of complex nutrients, rare herbal compounds, advanced anti-oxidants and powerful minerals and trace elements known to nourish the eyes. Miracle substances such as Bilberry Standardized Extract, Lycium Fruit, Dendrobium Nobile, Cassia Seed, and Chrysanthemum Flower are included to provide nutrients to improve vision. This Formula also contains bioflavonoids called anthocyanosides that are anti-oxidants that help prevent free radical damage and capillary fragility. Best if used with Master Paks. There is absolutely no other "Quit Smoking" product on the market that matches the effectiveness of this product. This formulation is a naturopathic breakthrough that provides the body with the needed nutritional support for those people who have made the decision to stop smoking. The all natural herbal ingredients are of the highest potency and concentration. This extraordinary formula was developed by a team of the world’s leading nutritionists. The herbal component was designed by a team of China’s premier phyto-pharmaceutical chemists. To enhance absorption and assimilation and to potentiate the other ingredients, these formulations are saturated in a special, rich water-soluble blend of minerals and trace elements. Many people who have tried to quit smoking and failed using other products, have had amazing results using the No Smoking Nutrition product. Spark up your life! This exceptional formula provides nutritional support for the female libido. Highly recognized herbs Tribulus Terrestris and Damiana are included. Best if used with Master Paks.